, son of the preceding, was born either in 1606 or 1607. 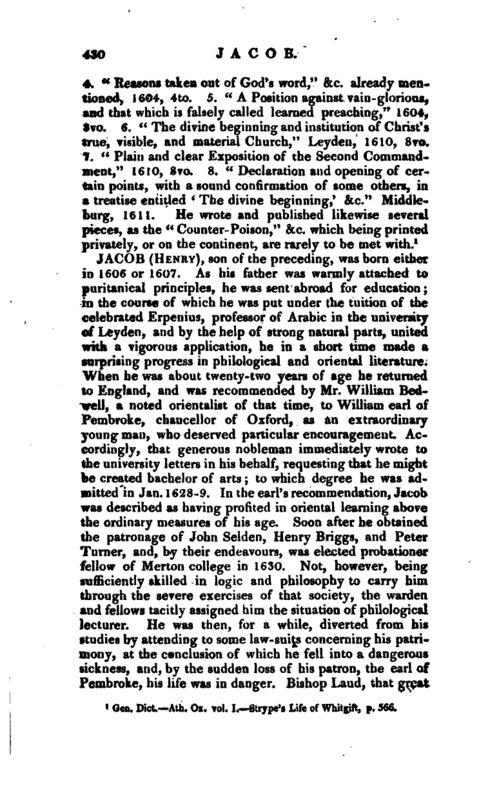 As his father was warmly attached to puritanical principles, he was sent abroad for education; in the course of which he was put under the tuition of the celebrated Erpenius, professor of Arabic in the university of Leyden, and by the help of strong natural parts, united with a vigorous application, he in a short time made a surprising progress in philological and oriental literature. When he was about twenty-two years of age he returned to England, and was recommended by Mr. William Bedwell, a noted orientalist of that time, to William earl of Pembroke, chancellor of Oxford, as an extraordinary young man, who deserved particular encouragement. Accordingly, that generous nobleman immediately wrote to the university letters in his behalf, requesting that he might be created bachelor of arts to which degree he was admitted in Jan. 1628-9. In the earl’s recommendation, Jacob was described as having profited in oriental learning above the ordinary measures of his age. Soon after he obtained the patronage of John Selden, Henry Briggs, and Peter Turner, and, by their endeavours, was elected probationer fellow of Mertonr college in 1630. Not, however, being sufficiently skilled in logic and philosophy to carry him through the severe exercises of that society, the warden and fellows tacitly assigned him the situation of philological lecturer. He was then, for a while, diverted from his studies by attending to some law-suits concerning his patrimony, at the conclusion of which he fell into a Dangerous sickness, and, by the sudden loss of his patron, the earl of Pembroke, his life was in danger. Bishop Laud, that great | encourager of literature, having succeeded the earl in the chancellorship of Oxford, a way was found out, from Merton college statutes, to make Mr. Jacob Socius Grammaticus, that is, Reader of Philology to the Juniors, a place which had been disused for about a hundred years. Being now completely settled in his fellowship, he occasionally resided with Mr. Selden, and assisted him as an amanuensis in one of the works which he was publishing, and which, we apprehend, must have been the “Mare clausum.” Selden, in acknowledging his obligations, styles him, “doctissimus Henricus Jacobus.” It is even understood, that Jacob added several things to the book, which Mr. Seldeir, finding them to be very excellent, permitted to stand. Nay, it is said, that Jacob improved Selden in the Hebrew language. In 1636, Mr. Jacob was created master of arts, and in June 1641, he was elected superior beadle of divinity. At the beginning of the November of the following year, he was admitted to the degree of bachelor of ptiysic: “but his head,” says Anthony Wood, “being always over-busy about critical notions (whicbr made him sometimes a little better than crazed), he neglected his duty so much, that he was suspended once, if not twice, from his place, and had his beadle’s staff taken from him.” In consequence of the rebellion, and his attachment to archbishop Laud, he soon became exposed to other calamities. Sir Nathaniel Brent, the republican warden of Merton college, silenced Mr Jacob as philological lecturer; and at length he was totally deprived of his fellowship by the parliamentary visitors. 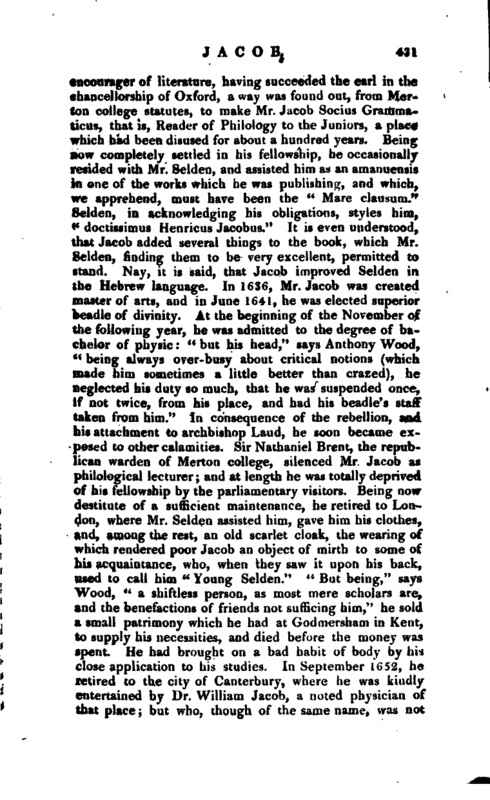 Being now destitute of a sufficient maintenance, he retired to London, where Mr. Selden assisted him, gave him his clothes, and, among the rest, an old scarlet cloak, the wearing of which rendered poor Jacob an object of mirth to some of his acquaintance, who, when they saw it upon his back, used to call him “Young Selden.” “But being,” says Wood, “a shiftless person, as most mere scholars are, and the benefactions of friends not sufficing him,” he sold a small patrimony which he had at Godmersham in Kent, to supply his necessities, and died before the money was spent. He had brought on a bad habit of body by his close application to his studies. In September 1652, he retired to the city of Canterbury, where he was kindly entertained by Dr. William Jacob, a noted physician of that place; but who, though of the same name, was not | related to our author. By this gentleman he was cured of a gangrene in his foot; but this being followed by a tumour and abscess in one of his legs, the discharge proved too violent for his constitution, and he died Nov. 5, 1652. The next day Dr. Jacob buried him in a manner answerable to his quality, in the parish-church of All Saints in Canterbury. 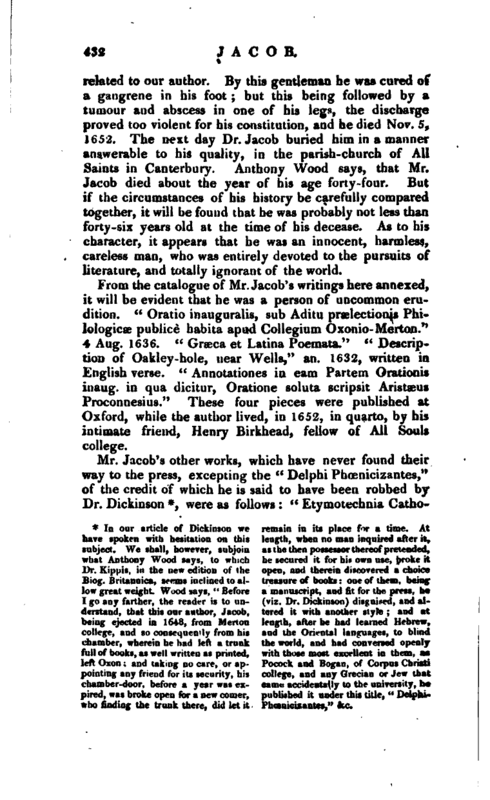 Anthony Wood says, that Mr. Jacob died about the year of his age forty-Spur. But if the circumstances of his history be carefully compared together, it will be found that he was probably not less than forty-six years old at the time of his decease. As to his character, it appears that he was an innocent, harmless, careless man, who was entirely devoted to the pursuits of literature, and totally ignorant of the world. 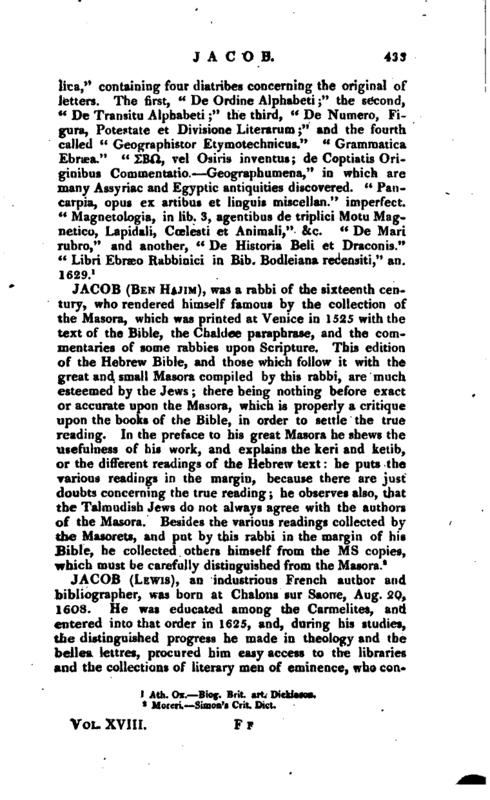 From the catalogue of Mr. Jacob’s writings here annexed, it will be evident that he was a person of uncommon erudition. “Oratio inauguralis, sub Aditu praelectionis Philologicse publice habita apud Collegium Oxonio-Merton.” 4 Aug. 1636. “Grasca et Latina Poemata.” “Description of Oakley-hole, near Wells,” an. 1632, written in English verse. “Annotaliones in earn Partem Orationis inaug. in qua dicitur, Oratione soluta scripsit Aristaeus Proconnesius.” These four pieces were published at Oxford, while the author lived, in 1652, in quarto, by his intimate friend, Henry Birkhead, fellow of All Souls college. pired, was broke open for a new comer, published it uuder this title, "
Ath. Ox. Biog. Brit. art. Dickinson.